Ask yourself this simple question: Is this the golden age of performance automobiles? We tend to think so. Fuel prices remain relatively reasonable, engineering advancements have provided us with more forced induction solutions than we can shake a piston at, torque-vectoring is not just brake-driven but power oriented as well, and automakers are taking unassuming family cars and are making performance models out of them. All of these facts are precisely why Ford decided to up the SUV stakes by releasing an ST version of its popular Edge, a twin-turbo, all-wheel drive family car for people who value the joy of the drive just as much as the vehicle itself. 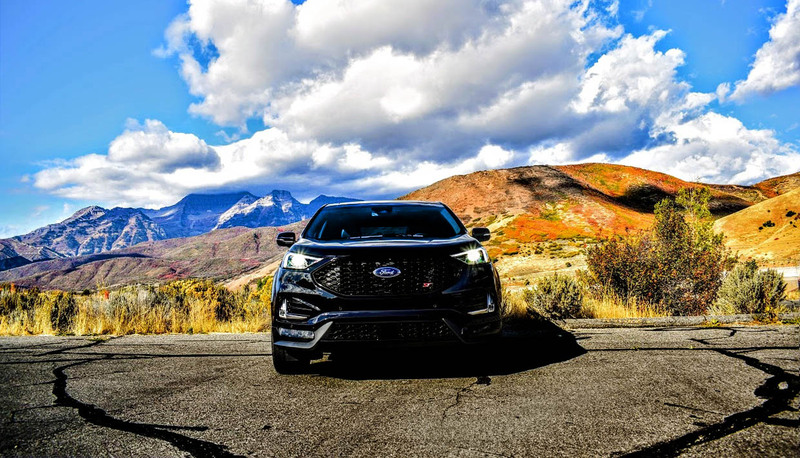 While we only had a couple days with the Edge ST up in the mountains of Utah, we were able to get a pretty good idea as to what America’s favorite truck maker is up to with this one, and what said vehicle offers buyers. 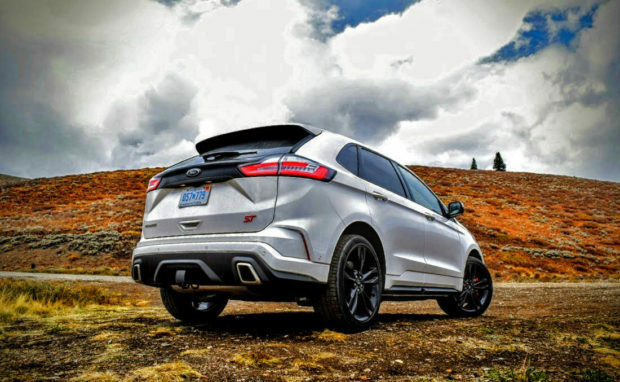 Ford’s goal was simple: Retain the practicality, styling, and all-wheel drive abilities found within the regular Edge, and then inject it with a twin-turbo V6, 8-speed auto transmission, upgraded handling, and a splash of ST sportiness, all while keeping the vehicle’s starting price under $43,000. 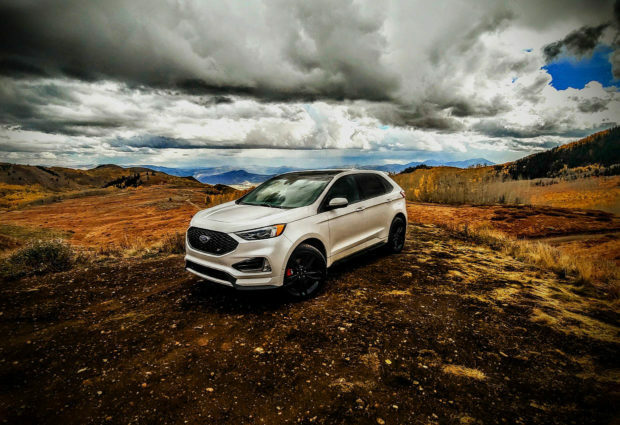 Aiming to target a niche market that values performance just as much as it does sensibility, the Edge ST positions itself in a corner of the SUV segment that is almost entirely made-up of luxury automaker offerings. While larger SUV options like the Dodge Durango SRT rely upon V8 vengeance, and vehicles like the all-new Acura RDX favor turbocharged 4-cylinder engines, the Edge ST sits somewhere between the two with its 2.7-liter EcoBoost V6. Generating 335 horsepower and 380 lb-ft. of torque. 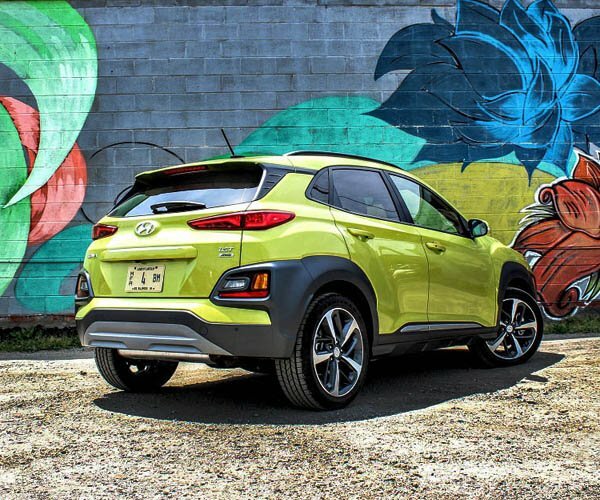 The Dearborn, Michigan automaker has upped the power found within the vehicle’s powerplant via a series of Ford Performance bolt-ons, and then supports them via additional cooling upgrades in key areas. 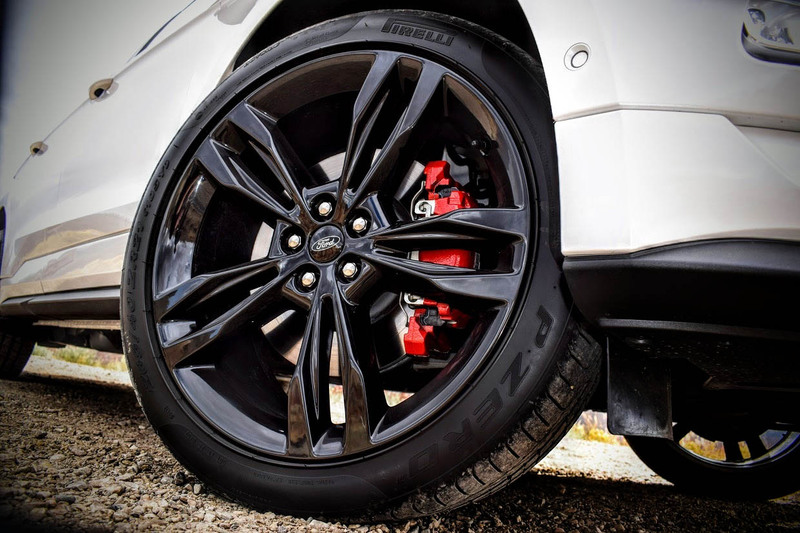 Brakes and suspension components are upgraded as well, with front and rear calipers, pads, and rotors receiving significant improvements over their stock counterparts. Stiffer springs and sportier struts tackle cornering concerns. Buyers can also opt for a “Performance Pack” when buying an Edge ST, which for $2,695 provides red calipers, revised front rotors and dust shields for better cooling, along with more grip-focused pads all around. This option also gives buyers upgraded Pirelli P-Zero summer tires, 21-inch gloss black wheels, and a brushless radiator cooling fan. 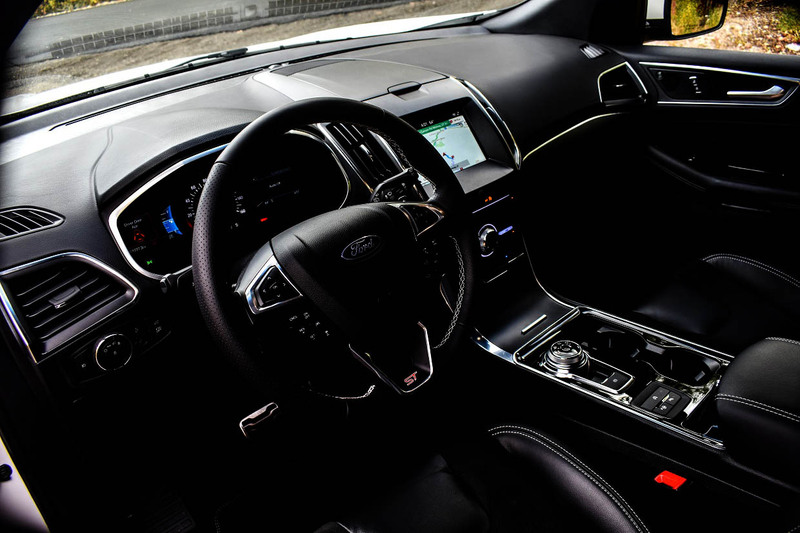 As for interior upgrades, buyers get add-ons like ST exclusive stitching, Ford Performance sill plates, branded and bolstered black seats, a sportier steering wheel, and some faux carbon fiber trim across the dash. 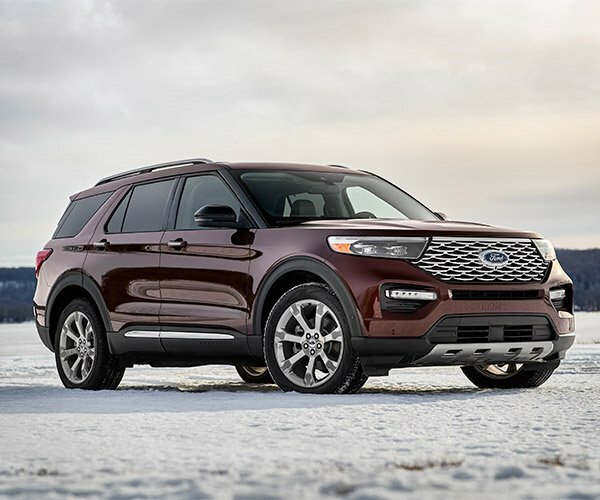 The shell of the SUV also receives some mild updates, including a more angular front-end and broader side skirts, exclusive headlamps, and unique exhaust finishers out back for encasing that true dual Ford Performance exhaust. 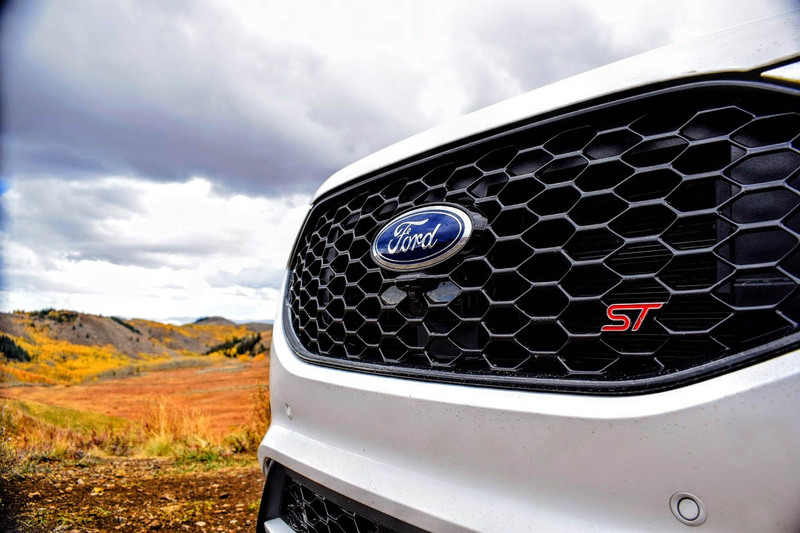 Like the driving dynamics of the vehicle itself, the visual appeal side of the Edge ST is well thought-out, but doesn’t fully tap into the vehicle’s true potential, a concern for those who prefer performance over all else. While a certain percentage of the people who will be driving an Edge ST on a daily basis will rarely fiddle with the “S” button tucked into the center of the drive select knob, or even consider paddle shifting into a corner in order to achieve the perfect rev-match, there are those of us who truly enjoy driving a performance vehicle the way in which it was intended. Bolting from a standstill in sport mode, the Edge ST torque curve packs on the pounds, a smooth, surefooted thrust forward that benefits from the revised shift patterns from the 8-speed gearbox, as well as sharper throttle mapping courtesy of the engine’s computer. On-board driver displays also come out to play in this setting, with a tachometer appearing the moment the “S” button gets mashed, a feature that can easily be toggled off in favor of monitoring AWD grip, boost levels, and more. 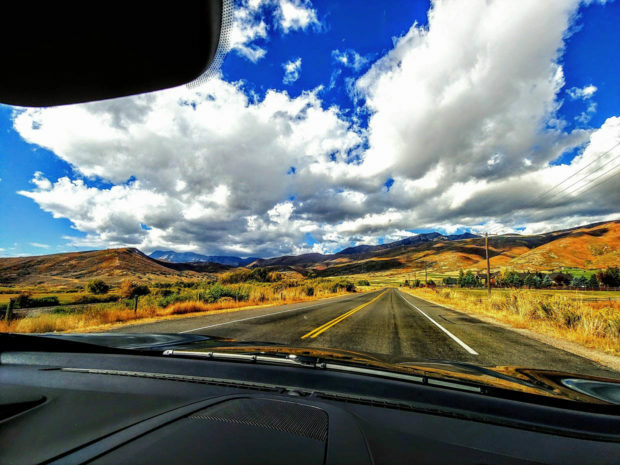 Zipping into the sparsely populated mountain passes of Utah, the Edge ST began to show its depth, along with a few surprises as well. 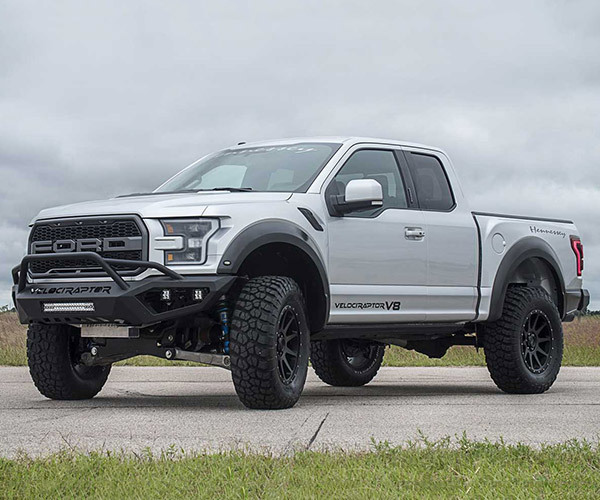 For starters, Ford’s decision to put up-sized brakes and sportier pads on this vehicle was a smart call, as little sign of fade or noise could be detected during the duration of the event. The ST also handled quite cleanly in the corners, providing just enough give to make the ride comfortable for passengers, and providing surprisingly low amounts of noise, vibration, and harshness (NVH). Come to think of it, one of the most impressive takeaways from my time with the Edge ST was its quiet, comfortable, and controlled driving characteristics, surely due in part to the softer, sticky summer rubber wrapped around each wheel. While limiting traction and stability controls (or toggling them off entirely) is an option as well, the refined side of the Edge ST still harbors more selling points than previously predicted. 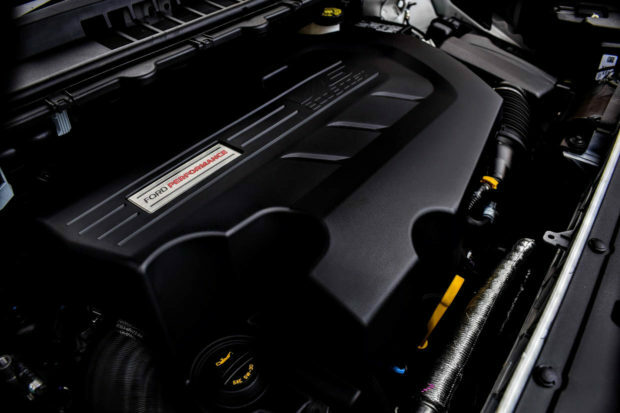 Although a throatier exhaust note would be more befitting of the badge, the burble from Ford’s “active noise control” setup does project a nice engine note when in sport mode, providing just the right amount of “raucous” for the type of people who shop for performance vehicles. Tucked neatly within the rear bumper, there is little chance of a child burning their leg on an exposed exhaust port here, further proof that despite its modifications, the ST still focuses upon practicality and safety above all else. As I mentioned earlier, don’t expect too much from the Edge ST if outright aggression is your vehicular preference, for much like other ST models, this machine serves as middle-ground between mild and more wild RS line. While the lack of interior packaging and cabin color options is underwhelming (because there are none), the way in which the ST drives also feels a bit caged. Despite being a true dual design, restrictions within the exhaust in order to keep noise down bottleneck back-pressure, so refined operation equals bridled ponies in this one. 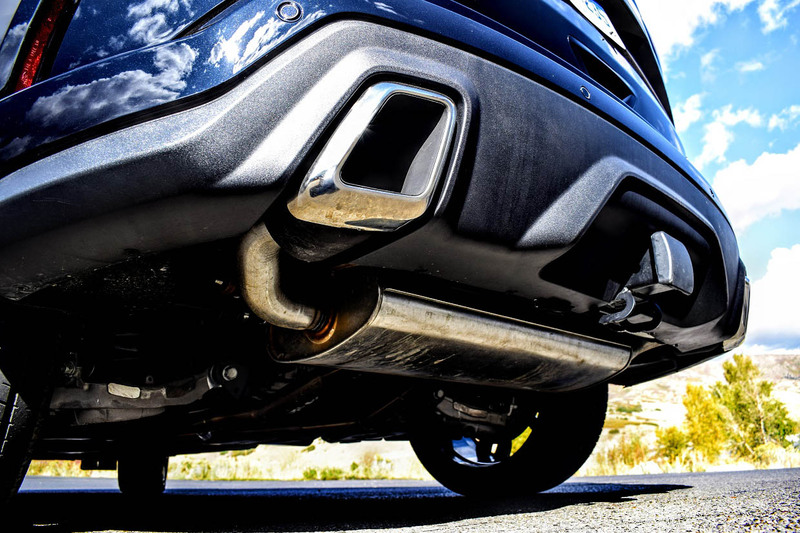 Limitations from the vehicle’s front-wheel bias are also worth noting, an almost completely torque-steer absent experience that prioritizes year-round traction over performance goals. 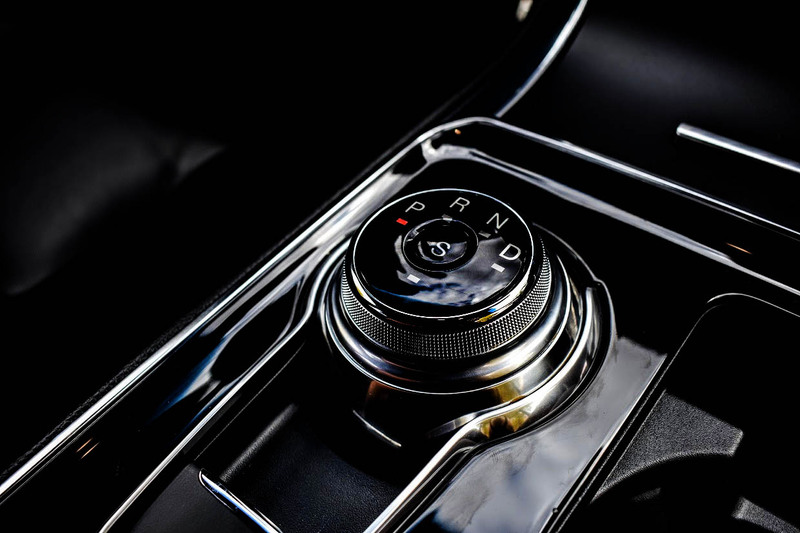 The 8-speed automatic also takes some getting used to, as it holds revs all the way to redline in order to allow engine braking when in sport mode, causing a lot of engine noise in the process, and falling short of the snappy 10-speed automatic found in other new Fords. However that’s the performance fanatic talking, and not the mom picking up her kids from football practice. For the people who value practicality, useful tech (i.e. 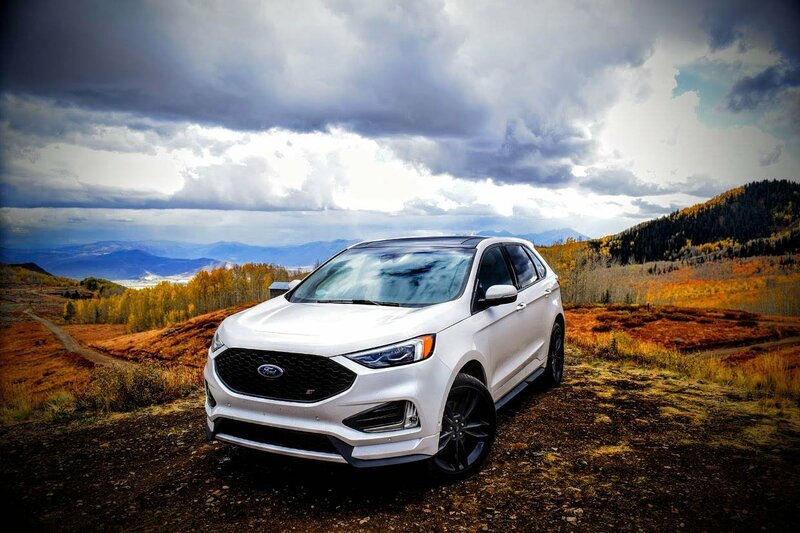 Ford’s Co-Pilot360 setup), and want an extra smack of performance looks and fun to go with it, the Edge ST is a must-drive SUV experience. Just be prepared to drop around $50,000 if you want the top of the line safety and tech suite as well as the Performance Package, which would be interesting to test alongside an Edge ST without said brake, wheel, and tire upgrades. Again, that’s the gearhead talking over here, but being that guys like me are the ones who help point our wives toward one particular vehicular over another, finding that niche between sportiness, value, practicality, and safety really is what will decide whether the Edge ST steals the show when it goes on sale this year.